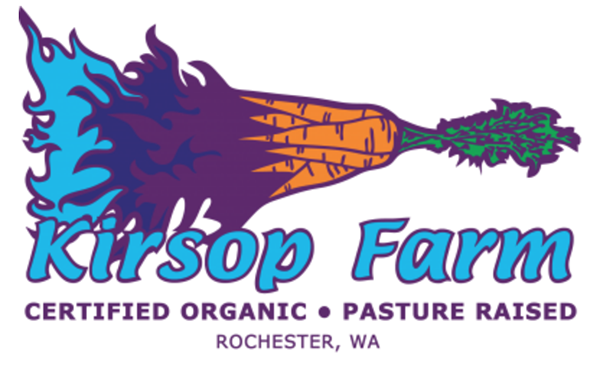 Kirsop farm began as a tiny garden in Tumwater in 1995, and is now a certified organic farm growing vegetables on 14 acres spread out over three sites all within the city of Tumwater. Colin and Genine lease a total of 25 acres and also grow grains, seeds, mushrooms and pastured poultry. We can be found at the Olympia Farmers Market Thursday through Sunday most of the year Please see our website www.kirsopfarm.com for information about our CSA program. At Kirsop Farm we are very proud of our fresh, delicious, and beautiful produce. Come see us in the spring for the first greens of the season, salad mix, bok choy, and radishes. Come again in summer to taste the best carrots in town, and all the other summer veggies you love. Be sure to visit in the fall for potatoes, onions, and garlic braids. We try to grow as many different kinds of vegetables as we can, maintaining a good supply of old favorites, and adding in something new often enough to keep things interesting.